The Environment Agency has published a very interesting (but rather clunky) online map of the potential for tree planting. This shows that they rate much of the land in the Cam Valley as “very high potential” for woodland planting. Planting lots more trees could be a very attractive way of improving water quality. A Forestry commission expert pointed out to us that even relatively small bands of trees (5-8m wide) can be very important in protecting rivers from contamination by the excess phosphates, nitrates and sprays that would otherwise wash into the river from intensively farmed agricultural land. In areas with public access he recommends planting willows (not Crack Willow!) Black poplar, Alder, Downey Birch, and lower shrubs, for example Gelder Rose. The Environment Agency map is available online here . It covers the whole country, and lets you zoom in to see the potential in each tiny little river tributary, which is great. Unfortunately its a bit clunky to use and only works if you’re using Microsoft’s Internet Explorer web browser. 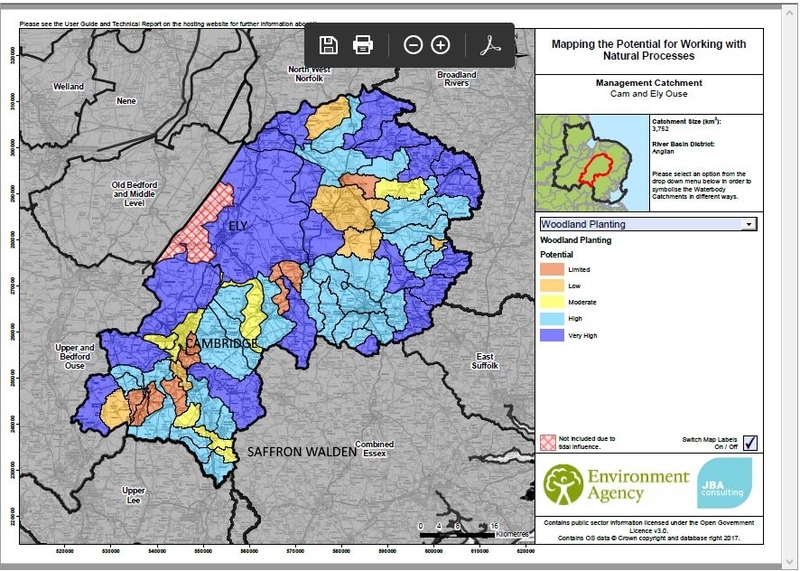 The image of the map above shows of the overview for the Cam Catchment. I have added the names of the key towns to make it easier to understand.